Chamomile, Matricaria recutita is one of the strongest herbs I know. The thing is, we tend to take it for granted. You can get it at the grocery store, you can order it at pretty near any restaurant – how could something so COMMON have any kind of potency as medicine? But it’s that commonness that clues us in to what very important medicine it is! Back in the 1930s, much of the country gave up herbal medicines in favor of chemical medicines, and the only herbs that survived in our modern culture were culinary ones – because those are “just flavors”. Of course, they’re not! They’re important medicines in their own right – so important that we put them in our foods to make sure we got them every day. 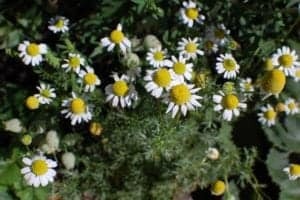 But Chamomile was one of the very few herbs that is not culinary but which we held on to as a culture. Why? Because it was too important to put aside. 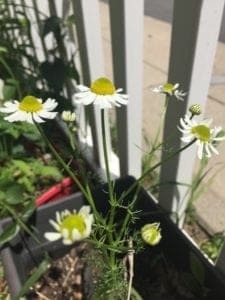 Chamomile is one plant that i definitely can’t live without. I have a lot of difficulty sleeping – both in calming down to fall asleep and also staying asleep, and Chamomile is a huge part of a good night’s sleep for me! Chamomile has strong anti-spasmodic action, both on the muscles and on the nervous system, so it’s the perfect choice when I feel like my nerves are buzzing and “spasmy”. I like to blend it with Ginger – another strong anti-spasmodic, but much more warming. The two together really help me to relax. Often, if I’ve eaten dinner a bit too late, that contributes to a difficulty sleeping, and both Ginger and Chamomile have strong benefits to the digestive system as well – so with one tea, I’m pretty much ready for anything! But wait, there’s more – you can drink this as a tea (you might have to wake up to pee, but I do anyway so I don’t mind), or take it as a tincture – or EAT IT AS A COOKIE! I came up with a recipe that uses powdered Chamomile flowers and candied Ginger to make the most delicious paleo cookies you seriously ever had – and they’re so relaxing! Great for tea time, bed time, or any time. You’ll find the recipe here. You can even give Chamomile to your pets. When our dog Elsie was just a pup and was spayed, we were worried: she’s very high energy, and how would we keep her calm for the week of recovery? It was Chamomile to the rescue. We sprinkled about a quarter cup of Chamomile flowers right on top of her dinner, and she gobbled them up. Better yet, it really did keep her calm! We’ve had cause here and then to repeat that for various injuries, and it works every time. If you have a very large dog, you might need a larger dose, and if your dog is a picky eater, you might need to stir it in and make sure there’s plenty of gravy. We gave it to her twice a day. In this photo, Elsie is with Pineapple Weed, a local variant which can be used fairly interchangeably. 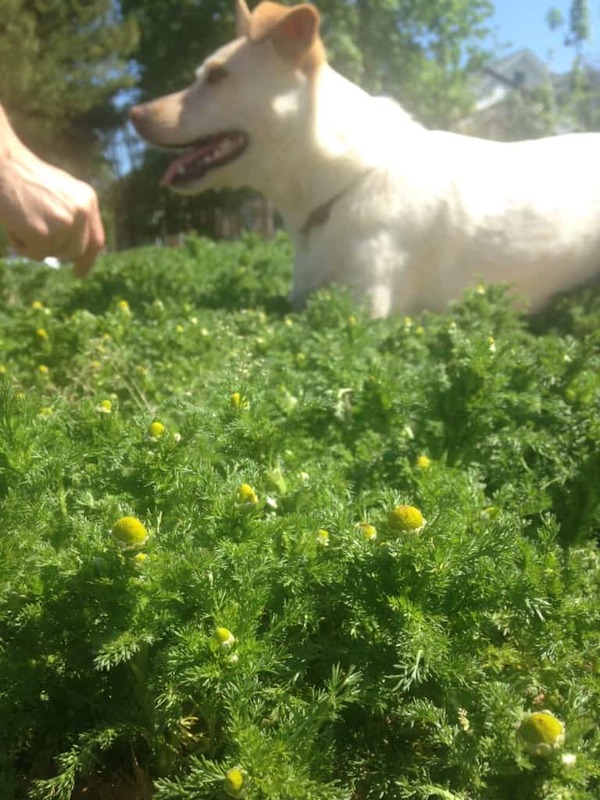 Matricaria recutita is somewhat stronger, but the Pineapple Weed is definitely effective, and it’s everywhere! Although it’s a less-commonly emphasized aspect these days, Chamomile is also a superb wound healer. A well-strained strong tea can be used as a wound wash or a compress. This effect has been studied – here are two studies of interest. A study after dermabrasion of tattoos – small but statistically significant. A meta-study on a wide range of effects, including wound healing. What are YOUR favorite ways to work with Chamomile? I’ve used chamomile for teething babies. It’s amazing for inflamed gums, and calming too. I make a strong tea, dampen a baby cloth in the tea, put in a freezer prrof container (I use a mason jar), and put it in the freezer until chilled, but not frozen. Baby naws on it and relieves pain and has calming effects. Great article and this is the first time I have heard of #herboftheweek. Can you tell me more about this #herboftheweek so I can find more articles like this? Every week, we choose a different herb to focus on, and share information via Instagram and Facebook (we have lots of fun stuff on YouTube too, and soon we may put our herbs of the week there too! ), and the end of the week, we post everything here on our blog. We add the hashtags so that other people who are doing “herb of the week” can find them. The “usual” way to do an “herb of the week” is to choose any herb, consume some every day in any form that’s appealing, and do a little research every day too. It’s a learning tool to increase your herbal knowledge! If you spend just 20 minutes a day studying an herb, for a whole week, you’ll know a lot more than you did before, and at the end of the year, you’ll know 52 herbs! If you’re googling for other articles like this, you can search with the word “monograph” – so for example, “Chamomile Monograph” will get you all kinds of articles similar to this. These articles are fairly short and informal monographs, others may be pages and pages long. You’ll find all kinds of great stuff!